Charles Amini and Norman Vanua take four as Hong Kong slide to 142 all out. Papua New Guinea's bowlers outperformed Hong Kong's in a low-scoring ninth-place play-off at Old Hararians Sports Club, defending 142 with relative ease. At the half-way stage, the Asian side were ahead, a disciplined bowling effort having restricted PNG to 200. Plenty of batsmen got off to promising starts, but none of them could convert it into anything substantial as the Hong Kong bowlers, led by Kinchit Shah's 4/11 in 3.2 overs, bowled PNG out in 48.2 overs. Electing to bat in the 4,000th one-day international ever to be played, PNG got off to a steady start courtesy of Tony Ura and Assad Vala. Both batsmen hit their straps early and looked unflustered for the most part of their innings. Ura was the aggressor, opening his account with a slog-sweep over deep mid-wicket off Nadeem Ahmed, the left-arm spinner, and then followed it up with a smooth square drive off Ehsan Nawaz. Vala soon joined in on the act, carving Nawaz to bring up his first boundary. Just when the PNG batsmen looked set to take the game away from Hong Kong, Nadeem struck, picking up two wickets in an over to restore balance. He first had Vala edging one straight to Scott McKechnie, the wicket-keeper, for 21, ending the 68-run stand for the opening wicket. He then zipped one past Sese Bau's defences to castle the No.3 batsman for a duck. Things went from bad to worse for PNG when Ehsan Khan trapped Ura bang in front of the stumps, ending the opener's 59-ball knock of 49. PNG, who were at one stage comfortably placed at 68/0 in 15.3 overs, suddenly found themselves on 72/3 six balls later. Charles Amini and Chad Soper then got together to rebuild the innings, taking their time and ensuring risks were averted. They took PNG past the 100-mark in 27th over, with Amini increasingly impressive during his stay. He cracked two fours and a six in his 32-ball knock, but his innings was cut short by Tanveer Ahmed, the medium pacer, for 21, and PNG were reduced to 109/4. The Hong Kong bowlers stuck to a plan, and continued to make life difficult for the batsmen. Soper and Mahuru Dai tried their best to get the PNG innings back on track, forging a crucial 59-run partnership for the fifth wicket before the former was trapped in front by Shah for a 72-ball 40. Soper's wicket triggered another slide. Ehsan Nawaz snared Dai for a 48-ball 34 while Shah got the better of Kiplin Doriga (5). Jason Kila (18-ball 21) struck a few lusty blows in the end to help reach 200, but the late impetus that PNG desperately hoped for never arrived - Shah's off-spin saw to that. Still, with a series of small totals having proved tricky to chase in this tournament, PNG were very much in the hunt, though their defence got off to a poor start as Hong Kong blazed away, reaching 68/1 after just 8.3 overs. Nizakat Khan was the first wicket to fall, unable to get on top of a well-directed bouncer by Norman Vanua. Charles Amini struck the next blow, claiming the key wicket of Anshuman Rath for 24, though it took a superb catch from Assad Vala to remove him and from there Hong Kong wilted, losing wickets regularly - six Hong Kong batsmen made it to double figures, but Babar Hayat's 37 was the top score. Hayat was the third to fall, bowled by Amini to leave his side 81/3, which soon became 85/4, the same bowler spinning one past Simandeep Singh's defensive shot. Assad Vala then dismissed Kinchit Shah, who couldn't keep a cut shot down, before Vanua returned to take two wickets in quick succession, forcing Tanwir Afzal to edge behind and then encouraging Scott McKechnie to slice into the covers. At this point Hong Kong were panicking, and their scrambled minds caused a run out a ball after the dismissal of McKechnie. 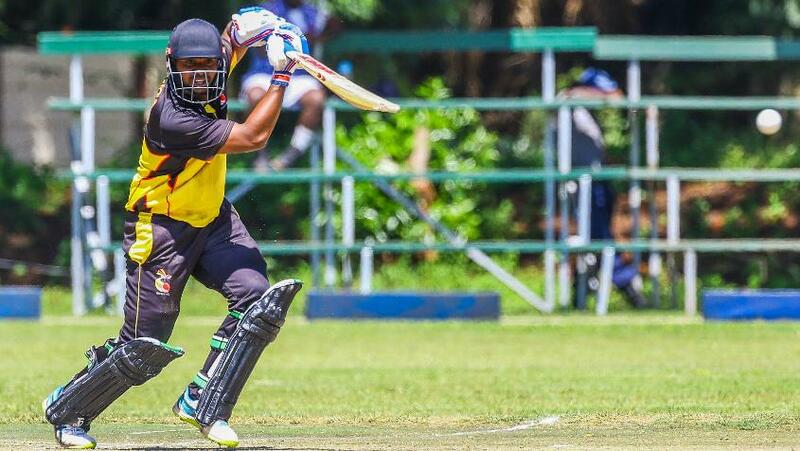 Vanua and Amini completed the formalities and four-wicket hauls as PNG claimed their first win of the Cricket World Cup Qualifiers at the last possible opportunity.